We ended up going with the Levin option. With a section of trail closed just after Scotts Road due to logging and wanting to minimise the amount of food that Sarah needed to carry without resupply, we opted for a bus from Palmerston North to Levin. I didn’t want to punish Sarah with 7 or 8 days hard tramping so I skipped a section. It would have been possible to walk a day of trail from Palmetston North but with no exit, I’d have to back track, wasting another day; then there was the closed section; and one day from the next access point to Levin. 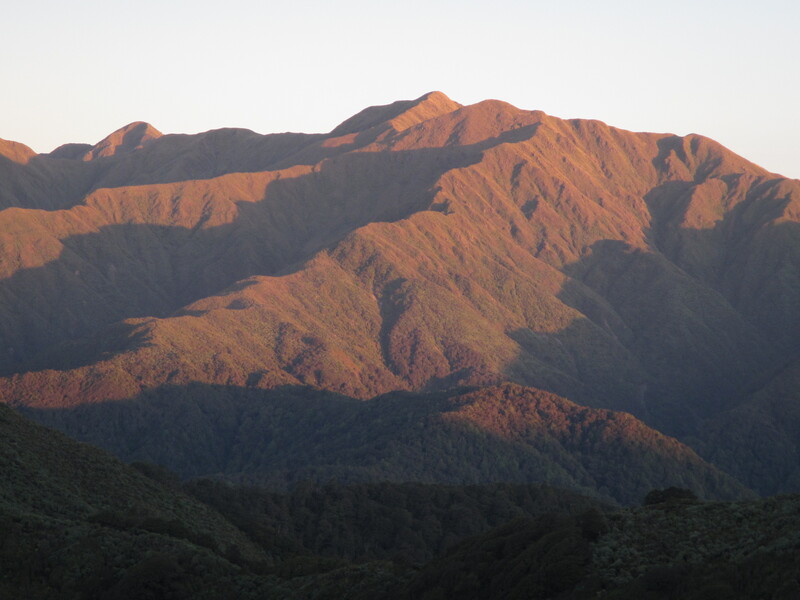 I knew the Tararua’s would be hard and the weather not looking great, with the possibility of having to wait a day or two on the range for weather to clear. So having Sarah loaded with 7 days of food was enough. We jumped on the bus for the half hour ride to Levin. It was a bitumen from town towards the trail head and we had around 7 or 8 kilometres to get in before hitting any actual trail. We were making fairly good time having only started walking from the bus at around 10:30am but it was looking to be a long day and our sights were set on Waiopehu hut. Around 3 or 4 km from the trail head a group of section hikers doing a car shuttle saw us and offered a ride to the trail head. We gladly accepted. The sun was out and it was hard walking on the road. After a little lunch next to the Ohau River we were on our way, only a kilometre to go from Gladstone Rd along Poads to the carpark. We signed the trail register and were on the way. Initially the trail wound through private paddocks, crossing the odd stile and hitting the forest edge around 1 kilometre in. From here it was mostly uphill, 8 kilometres to the hut gaining 800m in elevation. It was probably a bit of shock to Sarah’s system, carrying a fully ladened pack for the first time in a long while, having already completed quite a few km on roads and now hitting a trail that looked to go straight up. It was hot, sunny and very humid. But she did really well! Frequent drink breaks were the order of the day and it was good to go at a bit of a slower pace for a change. It also highlighted just how much my fitness has improved and how fast I actually do walk these days. Once up the slope and hitting a track junction, the grade improved a bit, not quite flat, always climbing, but easier going. The walking was great with the trail picking its way through old beech trees, with the delicate orange leaves littering the path and green all around in the canopy. Many types of ferns, grasses and mosses covering the rest of the ground. The flecks of white of fallen beech limbs being slowly covered by green as the moss encompasses whole logs and branches on the forest floor. We met a local couple from Levin towards the top, Don & Jane and their dog little Harry. Beth their daughter was ahead and most likely at the hut warming a pot of tea for their arrival. 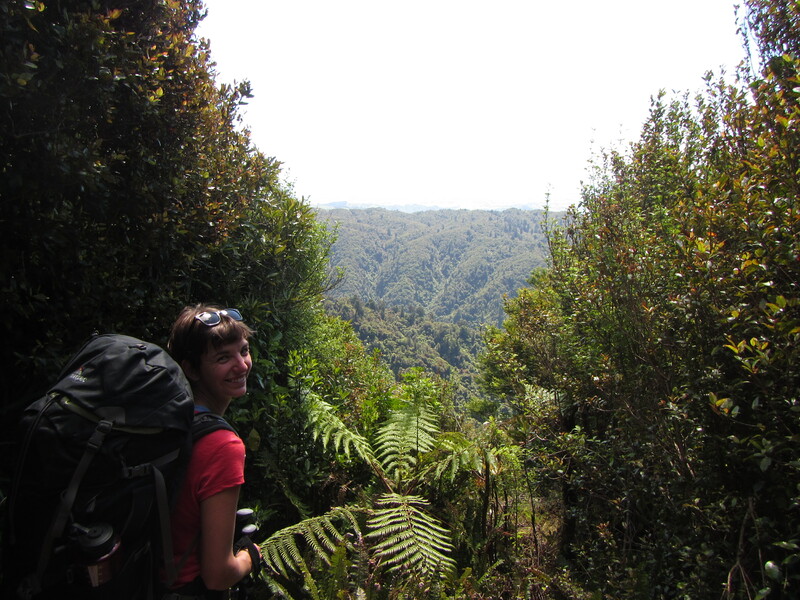 We walked and talked for a little while, before Sarah and I charged ahead to reach the hut and end day 1 in the Tararua Ranges. As we climbed higher, we came to a sudden change in vegetation, marking the gain in elevation towards more open alpine veg. We walked out of the trees and into stunted shrubs, flax, grasses, alpine flowers and the odd section of mud. Turning around in the now open clearings at head height was a sight to see. Views over looking the ridges we’d just climbed, the township of Levin and the coast near by. Kapiti Island stood out proud and in the far distance the northern extremes of the south island could be seen. Towards the north, the curve in coast line was obvious back up towards Whanganui and the townships I’d passed through in previous days, Fielding, Palmerston North just visible. 5 more minutes and we hit the hut, meeting Beth as she waited for her parents and getting settled in with a cup of tea. We spent the night talking a lot about tramping and gear with the Don, Jane and Beth and all manner of things. They were great. Although being local this was their first foray into the Tararua Ranges. They would just be staying at the hut tonight and heading back down tomorrow. A great nights sleep in a large hut with only a few people. say hi to sarah for me.